Button was born to be click.If you don't want they click, don't make it look like a button. Duolingo is an online education platform that helps millions of people around the world learn languages and also one of the most popular educational apps globally. It was selected by Apple as iPhone App of the Year in 2013, and by Google as Best of the Best for Android in 2013 and 2014. Building, supporting, and expanding on a platform used by that many people can be expensive and complex. Thus, Duolingo faced a profound challenge — how could they monetize a free, beloved product without undermining their mission or hurting the trust of their users. Duolingo saw ads as a way to build a sustainable business while still placing product value as the most important feature. When implemented properly ads can have a transformational effect on a business’s ability to grow. However, if implemented poorly they can be intrusive, poorly designed, erode trust and result in a bad user experience. 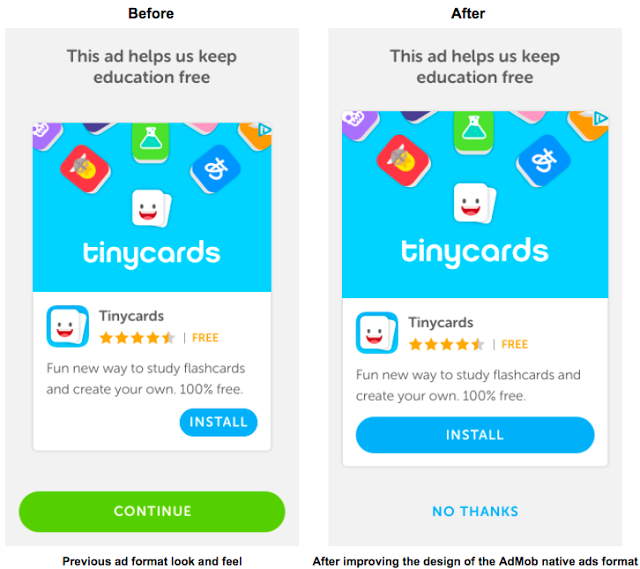 So to ensure the best user experience, Duolingo chose to use AdMob native ads — a format that allows fully customized ads to be placed in ways that don’t disrupt their student’s learning flow. Below you can see what the app looked like prior to the update and then after Duolingo integrated AdMob’s native ads solution. Duolingo had tested different ad formats, image sizes, designs, and messaging with the goal of increasing click through rate (CTR) without hurting user retention. Through these tests, they found that using large images, calling attention to the visuals of the native ad, and fully styling ads to match Duolingo’s distinctive visual brand delivered the most striking results. For example, Duolingo saw a 101% improvement in ad CTRs and an RPM increase with a single change by switching from small images to larger ones and emphasizing the call-to-action buttons within the ad unit. In case you wanna try my "Best Motivational Stories" application ! User can share your own motivation stories. Originally published at admob.googleblog.com on April 19, 2017.